The charming tower in the foreground is called the Simenon Tower. Georges Simenon was one of the most famous children of Liège and possibly the best known crime writer in the french language. He was the creator of inspector Maigret. I'd like to know what he thought of this building carrying his name. Greg, this has a dizzying effect. The tower so precariously balanced, the curve of the water and the wall. I imagine Simenon would appreciate the dramatic impact. Dizzying effect is right! But what a terrific building! And what a marvelous capture, Greg! I'd be willing to bet that Simenon would appreciate the drama of it, too! Very impressive and a bit scary. Not liking heights much, I think I should avoid it! Sure does look great, though! 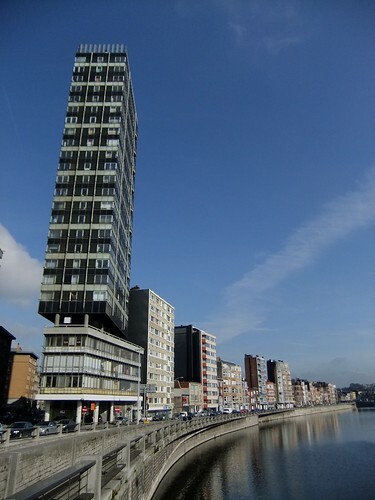 I am impressed by the unexpected architecture in Liege, new and old.